Mixed pack of 30 brushes suitable for all types of trout flies. 15cm pieces. 10 per pack. Fine wire brushes made with blended pearl, antron and UV fibres. A really easy to use body material. 2" fibres on a wire core. Very soft and mobile but still tough. Wire cored 'hackles' for use on saltwater and predator patterns. 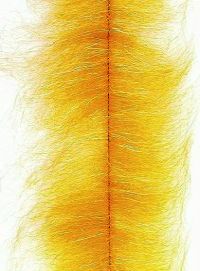 The hackle fibre is around about 5cm across, offering lotsof mobility in a convenient package.